Included a 30 minute-long interview with Alexander Paddington and a showcasing of the game on television. The recent football match between T&T and the US serves as a backdrop for computer all fours. 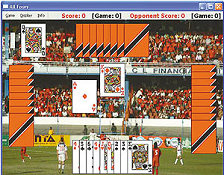 Twenty-year-old Alexander Paddington feels he has the Trinidadian alternative to computer solitaire. On July 14, at the Guardian office, St Vincent Street, Port-of-Spain, his fingers jabbed at the keyboard of his Dell laptop while he played computer all fours. Paddington, who attends Harvard University in the US, came up with the idea for the game while taking a computer course. He admitted the first version of the game was basic, but with programmer Jeff Bazanson on board, the game’s new version has been polished for commercial use. To prove his point, he clicked on the settings bar for the game and changed a bland green background to real life pictures of Balandra Bay, Maracas Beach and a football match between T&T and the US. Paddington, son of photographer Bruce Paddington, also enjoys playing all fours in his spare time. For the game, he researched by observing the Flying Angels All Fours League in Arouca. He noted that there would be rule variation options in the game as there are different rules in T&T such as the Tobago rules and the force follow suit rule. Despite the popularity of computer games world-wide, Paddington is still gearing the game towards specific markets. “It is definitely a difficult game to learn. After a few games with the computer you could get it, but we are aiming for a T&T and Caribbean audience,” he said. The main obstacles affecting Paddington so far, revolve around corporate sponsorship and production of the game. He said the cost of advertising the game and producing playable copies was $100,000 and upwards. According to Paddington, banner space would be provided for companies to advertise within the game. Paddington was also not against one company buying the rights for the game and using it as a promotional tool. Gaming Association of Trinidad and Tobago’s (Gatt) Gamecon exhibition. Gatt to develop a server for unlimited online play through his Web site www.allfoursonline.com. For Paddington this game will facilitate two favourite Trinidadian pastimes. Instant messaging support and support for signals to be sent within teams. Advance artificial intelligence for off-line play. True T&T game with trivia and Trini sayings. All Fours originated in England during the 17th century. The game remains very popular in Blackburn, England, where it is traditionally played in pubs. It is still organised into pub teams who play on Sunday nights. In America it is known as old sledge or seven up and usually played by two players with the full pack of 52 cards, with the ace being the highest and the two the lowest. The game, however, is seven points. There are four different items which count towards the score, hence the name all-fours. High—the highest trump out, scoring one to the original holder. Low—the lowest trump out, scoring one to the original holder. Jack—the knave of trumps, scoring one to the dealer, if turned up; if otherwise, to the winner of the trick to which it falls. For each ten (trump or otherwise) 10, for each ace four, for each king three, for each queen two, for each knave one. cards dealt, with valuable cards. A standard 52-card pack is used. points for the trump card. bland "congratulations" message with some cartoonish graphics.